The sides of the shell and the shell will be made up of M.S. Plates.The mill will be provided with a shaft appropriate to the diameter of the mill which will be welded and turned through from one end to the other and the mill will run free on self aligned roller bearing fitted with heavy duty pedestals. The mill will consist of one opening and two lids one for charging and the other for discharging fitted with a ball valve. A ball valve will be fitted at the side of the shell for gas discharge.The mill will be driven by a grid gear and pinion. The pinion will be coupled to a suitable gear box and that in turn coupled to a motor of appropriate H.P.The full assembly with the motor and gear box will be mounted on a three piece stand fabricated from heavy duty channel. A ball mill is a type of size reduction machine used to grind and blend materials for use in mineral dressing processes, paints, pyrotechnics, ceramics. It works on the principle of impact and attrition: size reduction is done by impact as the balls drop from near the top of the shell. 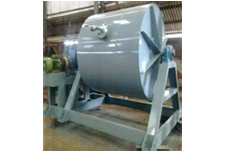 A ball mill consists of a hollow cylindrical shell rotating about its axis. The axis of the shell may be either horizontal or at a small angle to the horizontal. It is partially filled with balls. The grinding media is the balls, ""Which may be made of steel (chrome steel), stainless steel, ceramic, or bber. The inner surface of the cylindrical shell is usually lined with an abrasion-resistant material such as manganese steel or rubber. Less wear takes place in rubber lined mills. The length of the mill is approximately equal to its diameter. LID Size Opening 14" x 14" 15" x 15" 16" x 16" 16" x 16" 20" x 20"